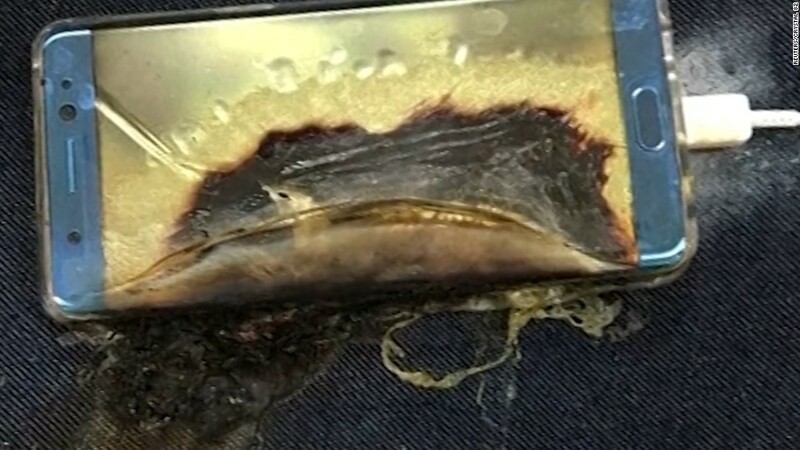 While details surrounding the recall are still trickling out, we rounded up everything you need to know about the incident and how Samsung is responding. The Note 7, which runs on Android, is brand new to Samsung's smartphone lineup. It was announced on stage at a glitzy press conference in New York City on August 2. Devices started to ship on August 19. 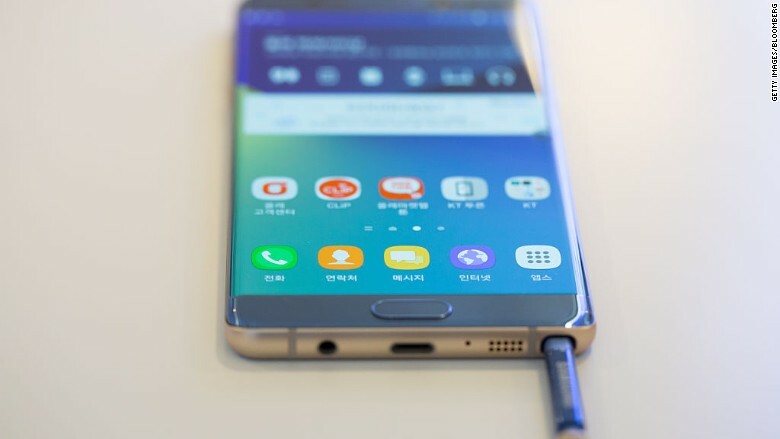 At 5.7 inches, the Note 7 is Samsung's competitor to the larger-sized iPhone 6S Plus (5.5 inches). It's buzziest feature is an iris scanner that unlocks the device. U.S. mobile networks sell the Galaxy Note 7 for at least $850. It received strong reviews from critics out of the gate -- heralded as sleek and powerful -- but some early users noticed the screen is much more susceptible to scratches than competing smartphones. Post-explosion photos, highlighting burnt and crisp devices, have since popped up on social media sites. One user told CNNMoney he was awoken at night when he "smelled something burning." The phone had melted. 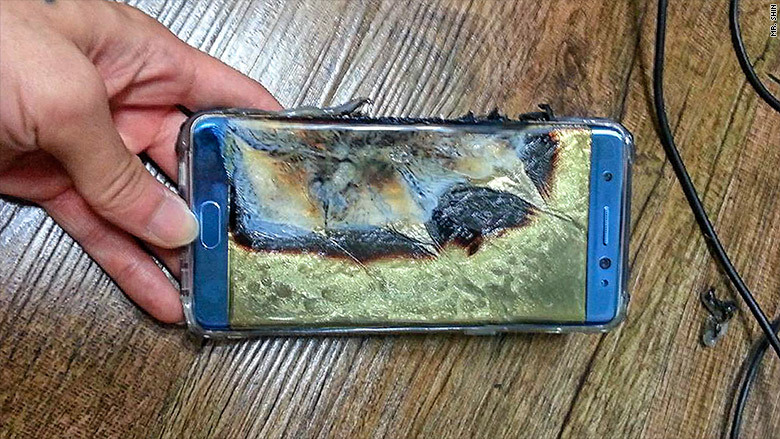 A burnt Samsung Note 7 smartphone. Samsung said most Note 7 phones should not be affected by the issue -- it's believed 0.1% of all devices sold are at risk. The company added that 2.5 million Note 7 devices have sold since launch. The devices are being pulled from 10 countries, including South Korea and the United States. 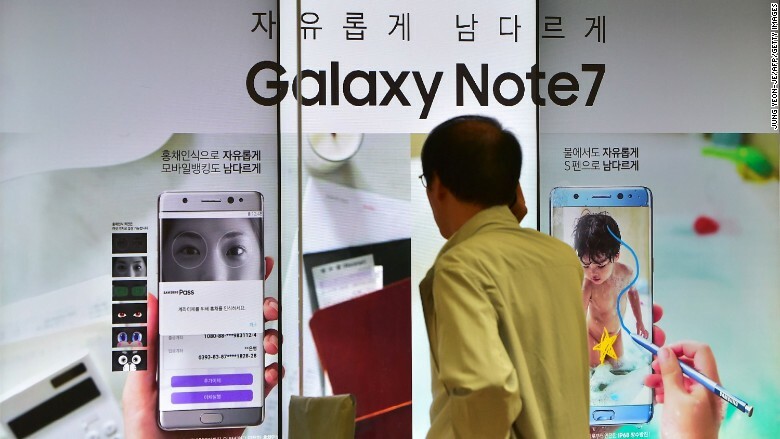 Samsung said China is not affected by the issue because it used another battery supplier. It's unclear if models sold in China would consequently be recalled. Samsung plans to offer Note 7 customers a new smartphone -- the Galaxy S7 or the Galaxy S7 Edge -- for free to replace the faulty product, starting next week in the U.S. The company said the full recall process will take about two weeks to complete, and the timeline will vary by country. It will also refund the cost of Note 7-specific accessories and give Note 7 users a $25 gift card or bill credit for the inconvenience. Target has stopped selling the phone and is working with Samsung to replace the devices already sold in stores and online. Amazon and Best Buy have also said they are no longer selling the Note 7. Best Buy customers can return or exchange the phone if they already bought one. Mobile carriers AT&T, Verizon, T-Mobile and Sprint have since suspended sales, while Sprint is offering similar devices for customers to use during the recall process. Problems with rechargeable batteries overheating are a relatively common occurrence. Earlier this year, the U.S. government recalled more than 500,000 hoverboards due to issues related to its lithium-iron battery packs getting too hot and catching on fire. The news comes as Samsung was just starting to get its groove back. Profits have been slipping in recent years. It also comes just a few days before Apple is rumored to launch its next-generation iPhone -- likely the iPhone 7 -- at a press event. It's unclear what the recall process will entail. It's also unknown if devices in certain countries are more likely to be affected than others. The company said details about how the recall program will work will be announced shortly. In the meantime, people worried about their batteries should contact their nearest Samsung service center. The U.S. Consumer Product Safety Commission, which handles recalls, typically tells consumers to stop using a product immediately when it puts out a warning involving a fire hazard. Charging should be avoided, as well: "This is what we told consumers for the hoverboard recalls: Do not charge the device overnight or when you are not able to observe the product," CPSC spokesperson Carla Coolman said.